This Summer is winding down and classes are getting ready to start. 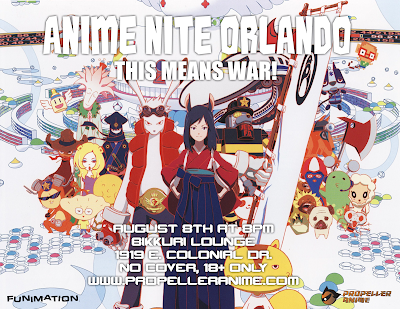 Before it all ends, we at Propeller Anime would love to host another fantastic Anime Nite Orlando! Join us on Thursday, August 8th at Bikkuri Lounge at 1919 E. Colonial Dr. Orlando, FL at 8pm! It's no cover to get in and you must be at least 18 years old with an I.D. to get in. Our main feature this time is one of the best anime films of this generation, Summer Wars. Directed by Mamoru Hosoda(The Girl Who Leapt Through Time, Wolf Children), Summer Wars is a movie that depicts the dangers of the world depending on technology for every function aspect of daily life. Kenji, who is great at math and bad with girls, ends up on a trip with his crush Natsuki to meet his new family as her pretend fiance. When the gargantuan virtual world OZ goes out of control and brings armageddon upon the real world, Kenji must team up with Natsuki’s family to save civilization! Bikkuri Lounge has fine Japanese cuisine available across the hall to-go. Drink specials at the bar are 2-for-1 beers, $3 wells, and $5 Crown Royal and Three Olives drinks. Once again, we will have a poll up for you to decide what we are opening Anime Nite Orlando with. The theme this time is school anime! Wait, don't go! There is actually anime that takes place in school that is worth checking out! Poll choices this time are Great Teacher Onizuka, School Rumble, Cromartie High School, Genshinken, Toradora, and Robotics;Notes. Poll closes Monday, August 5th at noon so vote soon! See you all August 8th for an exciting Anime Nite Orlando! idk where to vote, but GTO all the way! Our Anime Festival Orlando 14 Event Lineup!